Is this a hud problem or something else? [url=https://imgur.com/a/8CKBN]Here's[/url] the images for the lines in my clientscheme.res. I tried installing the font but that doesn't work either. The other weights of the font work perfectly fine somehow. Thanks, knew that command existed somewhere but just couldn't find its name for the life of me. not related to hud editing, but why can't I get updated huds to work? I've tried three different ones and the only things that work are the fonts and the startup loading screen. Hello, I'm currently using Broeselhud, I'd like to replace the overheal cross (http://imgur.com/rJJscUl) with the box from yayahud (http://imgur.com/Gl0bf6L). Can anyone tell me what I need to change in the hud? Is there a way to remove this. I'm using bwhud. After the meat your match update came out, I started hearing reports of this black loadout box appearing at the top of the screen. It doesn't allow people to switch weapons while it's active. Anyone know what this is? I am guessing that it is from not updating all the hud files or something screwing up in hudlayout.res. I recall having a similar problem but after I scrolled through all the changes in GitHub and updated all of my hud to get it functioning it went away, along with another black box at the top of the screen. Also have you tried binding a button to +quickswitch and pressing it down? That would be the other thing that I would try to fix the problem. 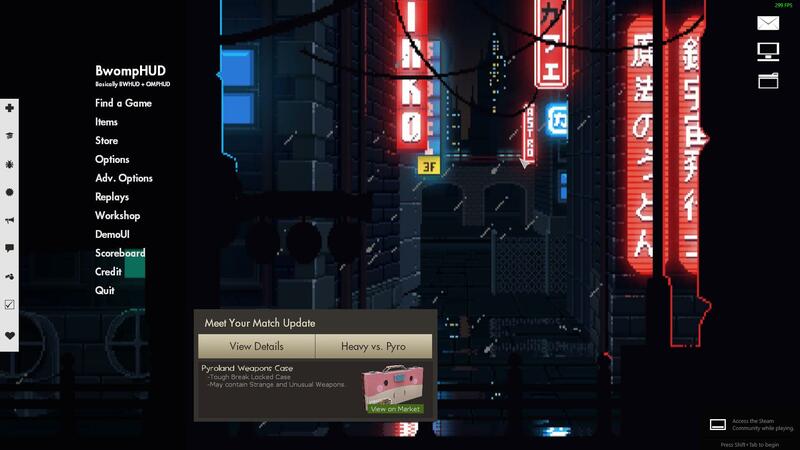 XenThePybro After the meat your match update came out, I started hearing reports of this black loadout box appearing at the top of the screen. It doesn't allow people to switch weapons while it's active. Anyone know what this is? Yes, I know about the quickswitch fix but that seems unnecessary. There should be a way to remove it without a workaround like that. I guess I'll check out the hudlayout diff, but I'm pretty confident I updated everything that changed in my HUD. 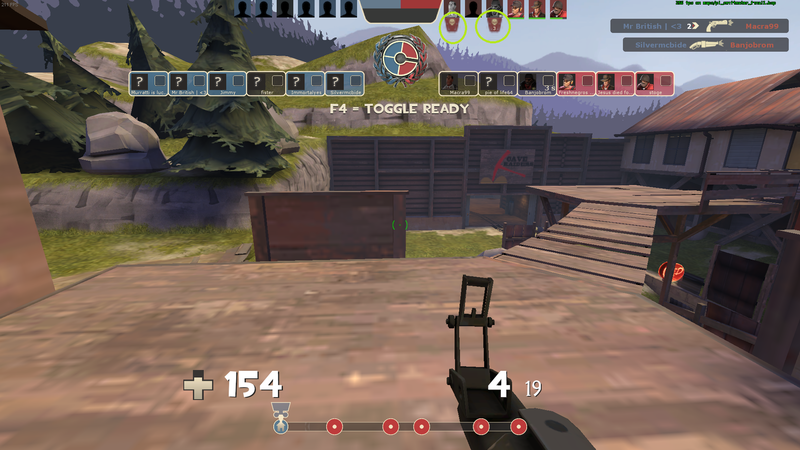 Which hud file contains the bit where you see your medic's medigun? Does anyone know why the TF2 characters have disappeared from the main menu? I'm finishing up my Overwatch HUD and it the characters seem to have disappeared off the main menu. I don't see anything that's making the character not show up. My game crashs everytime the timer reaches 10 seconds, so I asume it's caused by that animation. I replaced the part in hudanimations_tf, but it's still happening. So, I'm trying to record with Lawena Recording Tool and I've set the hud to Kill Notices Only, when I record there is a black square on the top of my screen. How do I fix that? Is there any way to remove this white line ? Is there any way to remove [url=http://imgur.com/GNFa6uC]this[/url] white line ? Stochast1c HypnotizeProbably not the best thread to ask this but, since tf_competitive_mode 1 is not working anymore for me is there a way to create a local sever and run the comp mode so i can edit my mm hud? #3324, while a demo has always worked, I'm more interested in a method to force the mm hud on while playing locally, unless there is a repository of mm demos. #3324, [s]while a demo has always worked[/s], I'm more interested in a method to force the mm hud on while playing locally, unless there is a repository of mm demos. CubekolIs there any way to remove this white line ? umlflaccid Stochast1c HypnotizeProbably not the best thread to ask this but, since tf_competitive_mode 1 is not working anymore for me is there a way to create a local sever and run the comp mode so i can edit my mm hud? Any answer to this question? Record a demo of a MM game and use playdemo Stochast1c#3324, while a demo has always worked, I'm more interested in a method to force the mm hud on while playing locally, unless there is a repository of mm demos. 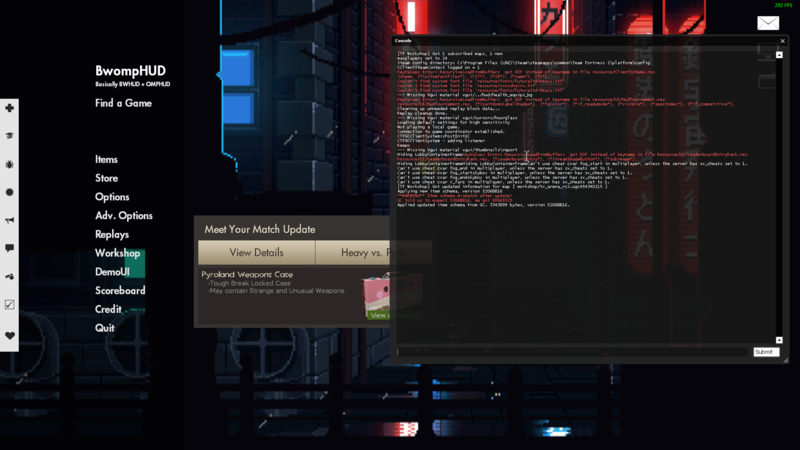 Demos do not store the fact that it recorded a matchmaking game. It will play back with the non-matchmaking HUD. I believe Wiet has contacted Valve to see if they'll add back a cvar to allow us to force it while watching demos. 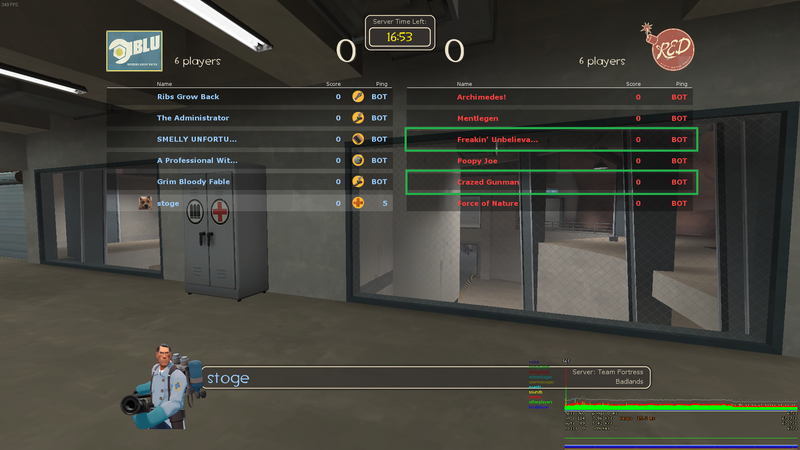 spawn a bunch of bots, type mp_tournament 1 into the console and join spectator. 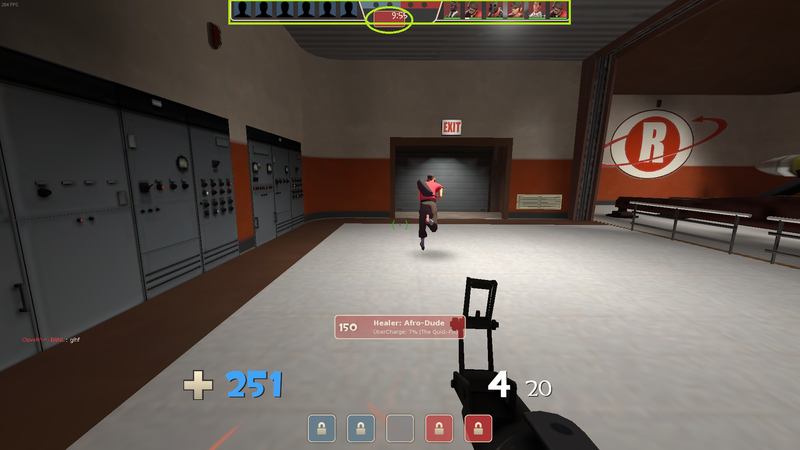 When I was screwing around with my scoreboard I found the bit that lets you display the gamemode on the scoreboard but now it is broken, both mine and on valves, after I enabled it. 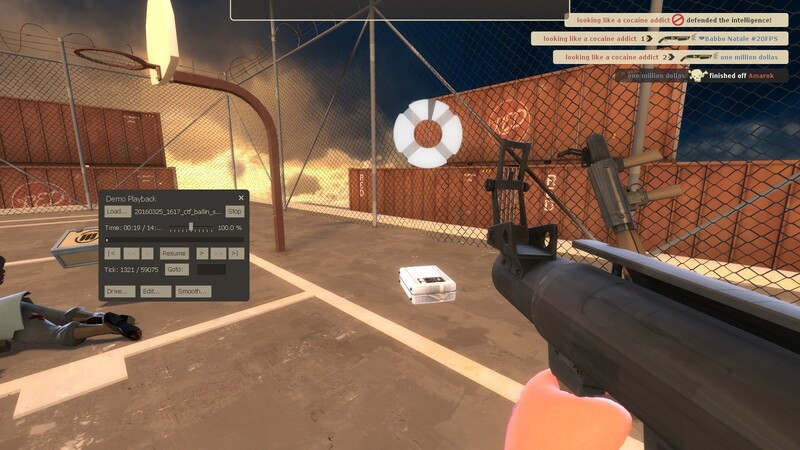 XenThePybro HypnotizeProbably not the best thread to ask this but, since tf_competitive_mode 1 is not working anymore for me is there a way to create a local sever and run the comp mode so i can edit my mm hud? The gametype part has been broken for years, it's not at all recent. It was pointless to have on the scoreboard mostly but I kinda liked it. I'm not entirely certain if this is a hud problem, but it happened after I installed mkhud. I noticed that all commands that were going through the dev console were showing up on the main ui. It was really annoying as I was bombarded by red text saying that some vtf files weren't acceptable, which isn't out of the ordinary, but I just don't want that to show up on the screen all the time. I tried searching this problem on google, but naturally it just came up with wiki pages of a list of all console commands.